A wonderful day spent at the Naples Botanical Gardens. Such a beautiful, peaceful place that we love to visit. Pilot Falcon with Noodlers Bulletproof black ink and Holbein watercolors in a Stillman and Burn Beta sketchbook. 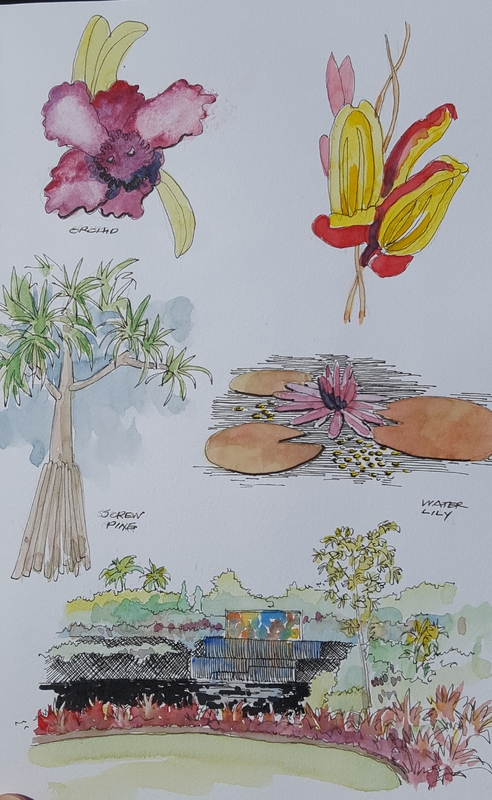 Is there any chance you would consider selling your pen and ink sketch of a day in the Naples Botanucal Garden? I have been looking for a watercolor of the Garden to no avail. I am one of the founding board members. We have moved back to Massachusetts, and I would love a remembrance. Your work is lovely, I am only interested in original artwork. Many thanks. I will also need to know dimensions. Jan, thank you for the kind words. We love the botanical gardens and it is because of visionaries like you that make these wonderful places. This is actually part of my sketchbook and journal that I keep. Where in Massachusetts do live? We live here also and would love to meet-up with you. I would consider selling this piece also. We live in Beverly. We spent 22 years in Naples, but moved back here to be near children and grandchildren. I do, however, miss much about the subtropics, particularly on a day like today when we turned on our heat to take the chill off. And I do miss my involvement in many environmental conservation projects. We know a Jacques family who live in Manchester, MA. Any connection? I do not have relatives in Manchester. I did live there dir a couple of years in the late 80’s. My nephew attends Salem State and we are in the area sometimes. We live in Middleboro. So my question is how large is the pen and ink drawing and what price would you consider, if at all. My husband and I are retired, so I do have some flexibility as far as seeing the sketch in person and picking it up.